Making caramel apples in the Fall is a long-standing sweet tradition! There are many ways to make the caramel, and an endless variety of goodies to decorate the apples. We chose to make caramel apple wedges that are pretty and easier to eat than whole apples. Melt caramel in the microwave. Add water to the caramel bits or candies. Microwave on high for approximately three minutes. Stop and stir the candy after each minute, and stop heating it as soon as it's thoroughly melted. Assemble the ingredients. You can make your own caramel sauce from scratch or from caramel bits or wrapped caramel candies, or use ready-made caramel sauce from a jar. 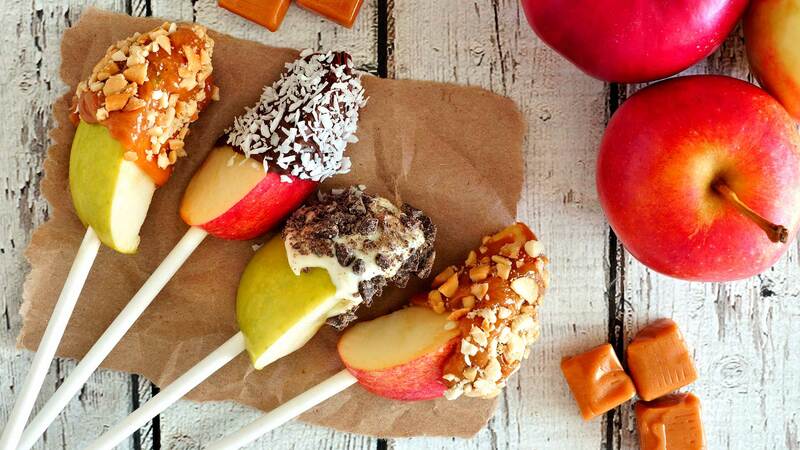 Gather whatever goodies you want to use for decorating your caramel apples. The possibilities are endless: chopped nuts, seeds, sprinkles, toffee bits, shredded coconut, and mini marshmallows. You can also use crushed cookies, chopped candy bars and mini M&Ms. Toppings need to be chopped finely so they adhere to the caramel. Prepare the apples. Use firm, crisp apples that aren't waxed. (The wax will keep the caramel from sticking.) If the apples are waxed, wash them with baking soda or give them a quick dunk in boiling water to melt the wax off. Dry them thoroughly. Use an apple slicer to cut each apple into wedges. Place each apple on a plate or cutting board and center the apple slicer on top of the apple. Push down with even pressure so the apple slicer cuts the apple into neat, even wedges. Immediately soak the apple wedges in the saltwater for 5 minutes, making sure they are completely covered. Pat the apples dry. Insert a stick into each wedge. The stick should go in to the apple about 3/4 of an inch. You can pierce the apple with a knife first to make the sticks go in more easily. Refrigerate the apples before dipping them so the caramel will harden faster. Dip the apple wedges about halfway in the melted caramel. Place the wedges on waxed paper or aluminum foil that's been greased or coated with cooking spray. Dip the apple wedges in the toppings. Return them to the refrigerator to harden the caramel. Store your caramel apple wedges. Store your finished apple wedges uncovered in the fridge. Or, you can wrap each of them individually in cellophane bags. You can find bags at party and craft stores. Set each apple wedge in a muffin paper cup before putting it in the bag. If you bag the wedges, don't store them in the fridge, they will keep for several days in bags at room temperature.